Fox's cunning used to be something you could use every time it ran out and get your avoided attack if you were attacked. Now it has a gap. That's nice for PVP as the guy fighting you can know when your gap is coming, or if you have it up and void it with a throw away. I don't know if you have ever pvp, either now or 3 years ago, but fox cunning has never been a game changer, you can dodge a single attack (only damage, you still can get controlled), which isn't much when a warlock or a wizard can hit you 10 times a second. Are you trying to pick a fight or something ? I mean you ignored what was said, mischaracterized what I actually said and then presented an edge case. Anyway just because something isn't useful in all situations doesn't mean there aren't situations where it's very useful. Think about one of those survival hammers that are made to get you out of a car that's been in accident. i think that sums up everything, and my point is, you are complaining about a power that you have never used and a game mode that you do not play and a nerf that isn't that much of a nerf. Not so long ago i was a combat pvp player, and let me tell you, fox cunning funciontality won't change that much, still does what it did before. Btw love the new revamp of the buffing skills, they look utilizable now. I wish they'd do something to fix the HR's very short range dodge. Totally worthless on the FBI hill, for example. Never understood why it had to be worse than the TR's. They fixed Careful Attack, I just tested to be sure. The ICD is global, as intended, but we no longer lose procs like we did before. So Balanced has left NWO. Which means in short, there is no way these changes aren't going through. Another mod of gimped HRs depending on the goodwill of friends in PVE and basically having to pass on pvp. Here is an example of my Archer in PvP in the current Mod on consoles... There is around 2% of my playtime of actually standing still. Its a decent build but really struggles against a group of players who work together. Now you are proposing to change my Stillness of the Forest (which combines nicely with Aspect of the Falcon) etc and take away 10% of the damage and a whopping 25% Crit chance? Note that I do lose the Crit chance anyway when near other players but 10% damage is pretty significant on its own. As a suggestion, since some people are probably not entirely thrilled about losing the range advantage of Stillness of the Forest, perhaps Aspect of the Falcon could be updated to provide much greater potency at range. Doing this would help ensure Archery can continue to do well at range, which I'm sure would be much appreciated by PVP archers and even some PVE archers too who are accustomed to being at range especially when soloing. Just Leave Stillness of Forest Alone And Change All Party Buff Range Equal To Knight Valor!! AotF could be buffed (and should be, considering the high closing rates that most classes have compared to HR's abysmal movement and absurdly long animations), but the real solution here is for us to stand up and demand that they cancel the ill-conceived change to Stillness of the Forest. There was just no reason for it. It's a boneheaded idea, period. Just reducing the animation time of things like Commanding Shot would be welcome. What's with the ghost moose anyway ? As it is playing on PC using keyboard and mouse about 15% of the time the ability doesn't properly fire because the key hasn't been mashed long enough. As noted earlier, this should be done also to keep things in line with the new duration of the capstone for archery. can we get marauders rush fixed so there is no delay at the end of the sequence ? if this can be done then MR will be a great combat encounter, as it is it delays about .5 seconds before an at will can be used and that severely hampers the 2 seconds of flurry. 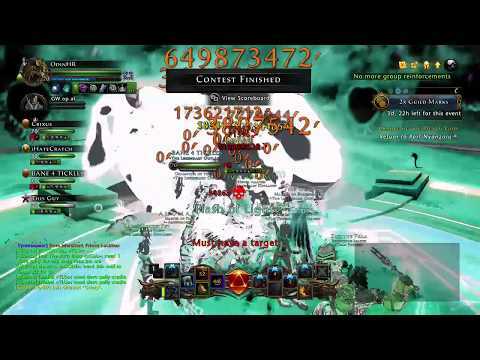 1 billion damage in 3 seconds. I'll admit that's pretty solid. I agree with noworries, that level of damage output is not acceptable for any class. All trolling, snarkiness, and inter-class rivalry aside though, the root of the problem is found in the powershare system and multiplicative nature of buffs. There should be some fixes to HR showing up on preview soon. On top of that we are looking into changing Aspect of the Serpent to be max stacks of 2 and you gain a stack even if you have stacks of the opposite type. Example: HR uses 2 melee powers in a row getting two ranged stacks. HR switches to ranged and does one attack. The HR now has one stack of melee and one stack of ranged. any word on trapper's roots being able to scale with buffs? or bladestorm able to proc out of gushing wound/plant growth? that's far from normal. lol. I know i've never seen anything that crazy. I'm sure they have metrics that are spit out that they are going off of showing normal damage ranges. if the hr were the kind of beast the tr is we'd all know it.. but hr's as a general rule cannot hope to out dps a tr atm. Thanks for considering some of the feedback we've given. That implementation holds interesting possibilities for Combat as well as Trapper. So you've undone the misguided change to AotS and made it better. Thanks. Great. How about undoing the even worse change to Stillness of the Forest, which will kill the only (slightly) viable pvp build left to HRs and make archery even more worthless in PVE? I will only pester you this once to bring up one other thing that will possibly destroy the Archer Path. Please please look into the change to Stillness of the Forest. I have many PvP clips you can view any time you like, you will never see a player (especially Archer) stand still... The change to this Feat is something that needs to be reversed. Getting back 25% Crit chance is near impossible so bye bye Crit builds and 10% damage is massive... No-one will use that Feat. Stillness is one of the actual decent things an Archer has going for it. You should just add to it instead... say for instance "If no Players or Allies nearby (20-25feet or something) get a huuuuge buff to damage, this feat is half as effective in PvP". Not neccessarily that but something that buffs an Archer significantly whilst at range on his own... Or just extend buff range to include an Archer if the Capstone is taken or something. Please also fix the daily "Disruptive Shot" animation which at end of it, it push the character back of couple feet (we need the push back part removed), this is also very annoying for who plays at max range, as then we result to go out of range for the next power we activate, it even break the new Stillness of the Forest since it detect a movement (this is hilarious yes) since we don't want SotF to work as the way it has been changed, as stated by tons of ppl already said in here. 1) Completely boneheaded proposed change to Aspect of the Serpent averted. Trappers can keep trapping, although with completely inadequate DPS. 2) No help on completely boneheaded change to Stillness of the Forest so far. So HR is at this point utterly dead in pvp. Unlike other classes HR has no abilitiy to combine control, damage and survivability. Damage, though high, is still less than TR, SW, GF and GWF. 3) No help for total lack of survivability in pvp. 4) Healing abilities remain pointless. Underpowered and irrelevant. 5) Damage resistance self-buffs remain pointless. Underpowered and irrelevant. 12) No help on reducing the crit chance penalty of Skirmisher's Gambit, which requires HR, unlike every other class, to stack 4000 extra crit to make an adequate pve build. 13) No help on pve damage, which is less than CW, even though CW's supposedly low damage merited a real rework for that class. 14) No help on previous uncalled-for target cap nerfs to many abilities. 15) Mystifying removal of buffs from companion for this and ONLY THIS class, rendering it even less effective in pve. 16) No help on failure of thorned roots damage to scale with soul sight crystal, etc (as others have pointed out). 17) At-wills other than Aimed Shot continue to be irrelevant for damage except the highly buffed melee at-wills of the combat path. 18) Dodge continues to be too short to be useful, so at the same time the only viable pve path is combat, the HR will continue to be unable to dodge out of most mobs' (and players') melee and AoE powers. I hope u are not suggesting archer to play at melee because that totally not an archer at your so called "rational nature". For balance sake, those feature/buff that scale damage with distance are essential to ensure archery gameplay without having melee to abuse them. If they are not scale with distance, any melee HR could have slot it and call it a win and totally removed archer out of the picture. Range archer are already handicap with using only range encounter. Its fair that there are buff/feature that scale damage with distance to enhance their gameplay. If u are playing point blank archer build, u already has melee encounter to use and melee feat to spec. Asking for feature like AotF or hunting hawk buff to buff u at melee are just greedy and inconsiderate towards range archer as it further remove the reason for archer to play at range. If you are eyeing for them, just forget it. Those buff are not for melee build just like buff like Aotp are not for range build. Deal with it. 2) No help on completely boneheaded change to Stillness of the Forest so far. So HR is at this point utterly dead in pvp. 4) Healing abilities remain pointless. 5) Damage resistance self-buffs remain pointless. This is a good example that when they try improve the class it usually just makes it worse. I would just love to know what the thinking process is for the people behind these changes. Why exclude companions from receiving benefits from buffs? Regardless of what I have been equipping my companions with, they are even squishier now than before and provide little to no benefit when in a fight on the side of a Hunter Ranger. Healers especially are completely useless as they are the first to die and the last to do anything. At least the buffs helped a little to delay a companion's untimely demise. At this point, I might as well have my Hunter Ranger slotted with augments only. Please don't do this. You can avoid the push back by jumping if that's what you need. The push can be used as a valuable re-positioning tool in other circumstances. The current implementation is more flexible, with a wider variety of use cases. Whilst your fixing Aspect of the Serpent you can go right ahead and make it better. Because HR cannot compete in PvE or PvP as DPS. That makes the class useless. So cut the "Only 2 stacks" nonsense right out. Give them 4 and let's see a real improvement. No the push back is an unexpected thing, which was reported more times during the past 5-6 modules and it was never fixed since, and since every Archer has this in its rotation, while playing at max range it just bring you out of range, and the need to move forward before be able to play the next power is a loss of time, plus it breaks up this new version of Stillness of the Forest (if that will stay like it is now) at the whole.